As the ban on smoking in public places looms, Savile Row shows that it has its finger on the pulse of modern Britain, with a new slant on an old favourite. This is the Surfing jacket, not unlike the old Smoking jacket but lighter, brighter and with pockets that may amply accommodate a CD or two. Alan Bennett, proprietor and tailor of Davies & Son, the oldest name on Savile Row, says he is offering this new design in response to comments from his customers. It may be made in colourful silk, or cashmere, or even tartan, still impeccably tailored, and available either with the classic frog fastening, perhaps a toggle, or simply belted, maybe with a suitable iPod breast pocket. The classic Smoking jacket (right from Davies ) became popular with Victorians, when the smoking habit had not yet been taken up by ladies. It was thought that a gentleman might retire to his study, don his smoking jacket and perhaps a smoking cap, and not offend delicate female nostrils with his smoke, or the smell of tobacco on his clothes when he emerged. It went on to become a rather glamourous option, with connotations of seduction and debauchery suggested by its role in early movies. Sadly, these have long since faded and indeed the web’s Wikipedia maintains that the Smoking jacket is “now relatively rare”. Not according to Savile Row’s tailors, however, who report that there is a steady if small demand, generally for the classic double breasted style, traditionally in velvet, originally quilted, with shawl collar and frog fastening (as above). At Henry Poole, they see a reappraisal of its role into a lighter, brighter mood as reflecting how they first launched it for Edward Vll's in 1865 , when they made it in silk. At Dege & Skinner, they feel the Smoking jacket's role could perhaps now be seen more appropriately as a Host's jacket - the garment of choice for relaxed evening entertaining at home. 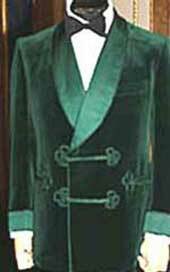 The example at left is a rather flamboyant silk Smoking jacket made for the Iron Duke. Bennett sees his Surfing style giving a new lease of life to the old Smoking version. “Not just for our younger customers, either. Silver Surfers represent an important group,” he points out, “with great purchasing power. I think a smart jacket for a relaxed evening spent surfing the web with drink in hand should appeal to them. See the Clubs page for details on how some of London's top smoking spots plan to ease the pain of prohibition. THIS CLASSIC shot of Sir Winston Churchill is taking pride of place in Henry Poole's window on Savile Row, accompanied by a replica of the chalk striped flannel suit he wears, which they made for him around 1936. It was shown at the Italian 'London Cut' presentation earlier this year and has aroused such interest that orders have been received for "the Winston Churchill suit". Poole's had the cloth specially woven by the same West Country mill that made the original - but now in a lighter weight and with some cashmere in with the wool. The photograph is shown by permission of the Imperial War Museum - well worth a visit. 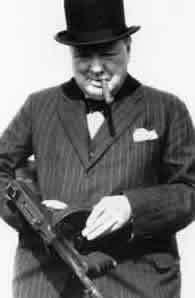 What would he have made of the smoking ban? This edition focuses attention upon the London Season, with all its fixtures and the social whirl that goes with them. And the forthcoming ban on smoking in public places also prompts a look at the prospects for smokers here. Savile Row lost one of its great figures early in May, when Lord Bernard (Jack) Weatherill died. Former Speaker of the House of Commons, he came from a tailoring background - his father's firm was Bernard Weatherill Ltd. He rose to one of the great positions in British politics but always carried a thimble to remind him of his origins, and remained a loyal friend to Savile Row and its tailors. Apprenticed in the family firm, he chose to enter politics after WWll and became one of the most popular Speaker's, known for his wit, courtesy and fairness. He stood down in 1992 after serving 9 years as Speaker. He continued to attend tailoring events over the years, was a great spokesman for the trade, and an example of that now rare breed, particularly among politicians - a kind and honourable gentleman. REGISTER to be mailed when the next edition is online in the Summer.